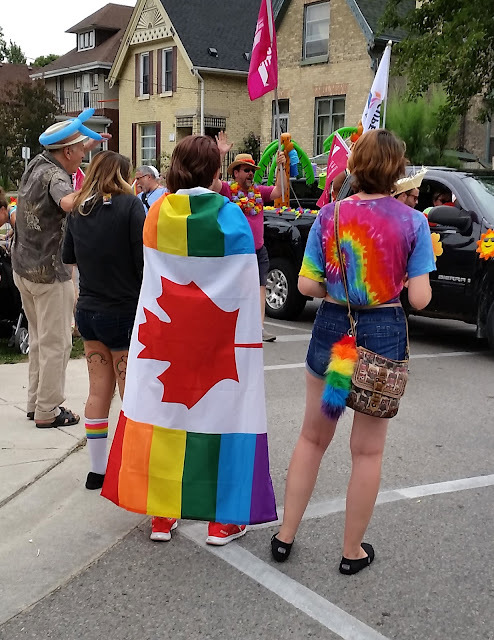 Today was our annual Pride Parade, which caps off almost two weeks of Pride Festival activities here in London, Ontario. 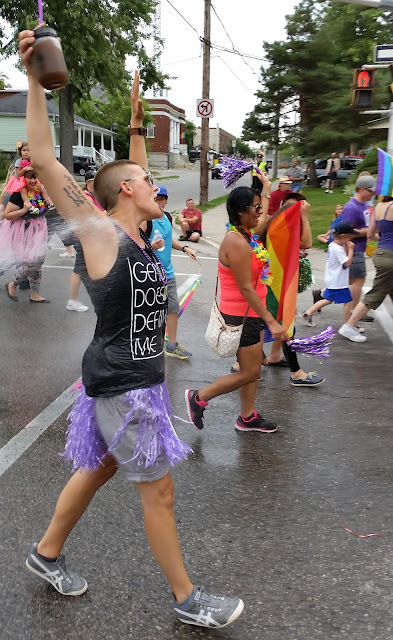 Following this year's unusually small contingent of Dykes on Bikes was a group carrying signs with the names and photos of the people who were killed in Orlando at the Pulse nightclub on June 12th. 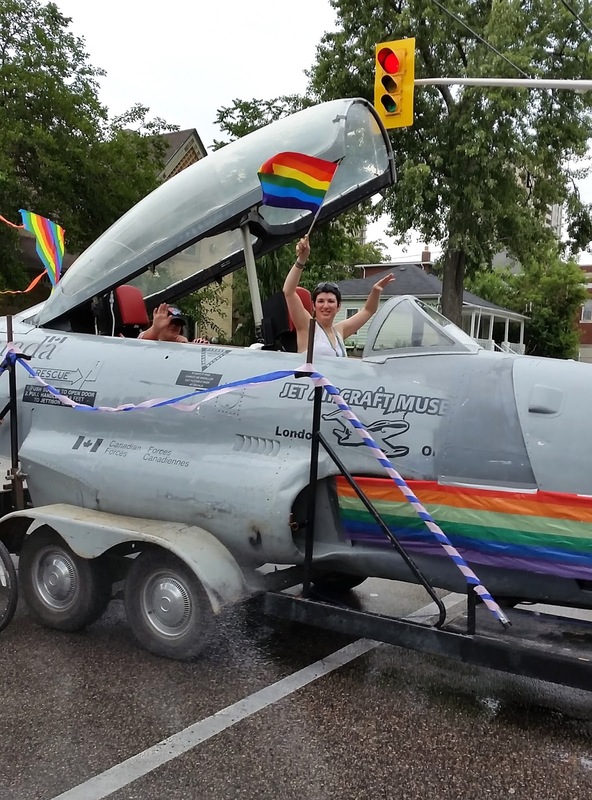 Most Pride parades that have happened since that date have included a memorial to the 49 victims. 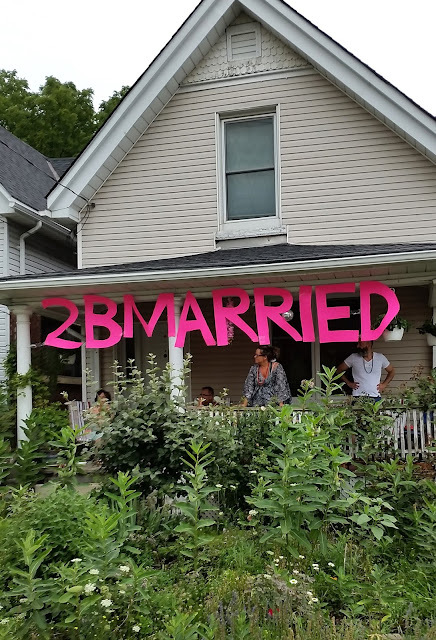 I usually watch the parade from the sidewalk in front of my friends Mario and Sarah's house, and this year, there was to be a party on the porch after the parade to celebrate the impending nuptials of Mario and his fiancé Leif. Their sign generated a lot of well wishes from parade watchers. 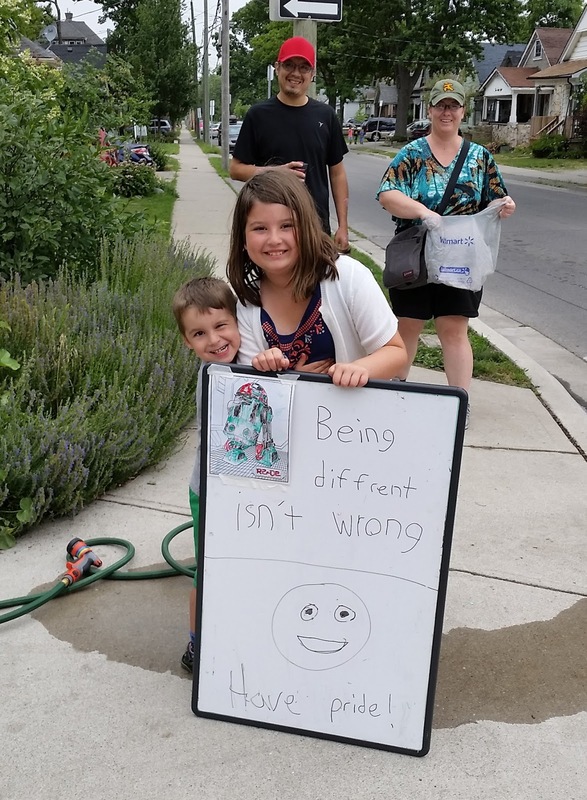 My neighbours came to watch the parade with their kids, who brought a sign they made to hold up at the parade. Good parents, great kids. 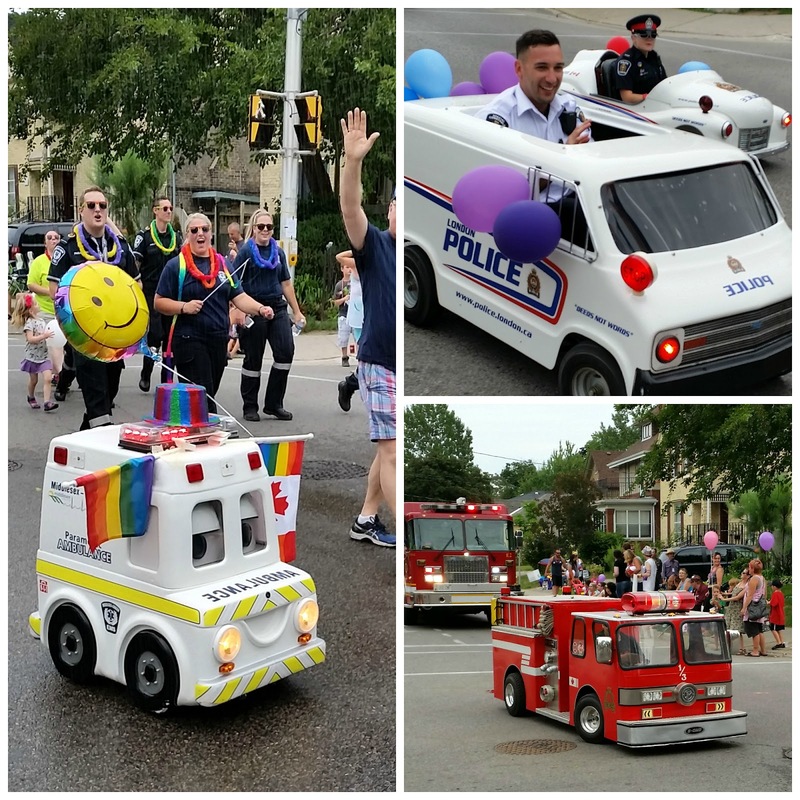 The police, paramedics and fire department all have small versions of their vehicles they use in the parade. The guy driving the mini police van looked like he was having a good time. 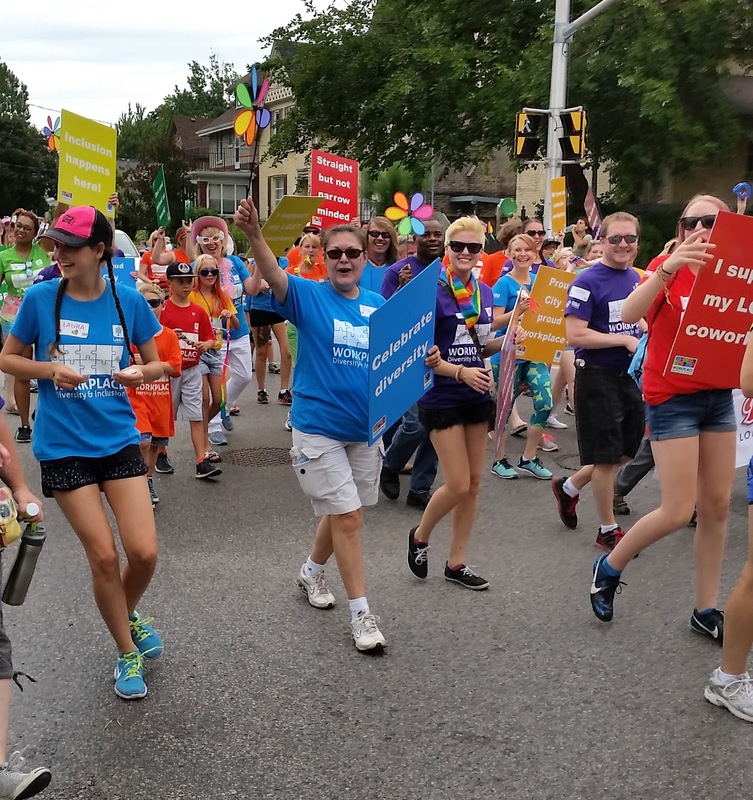 The parade is very much a community event - while we don't have the lavish floats that parades in larger cities have, we do have a good turnout of people representing various local organizations. 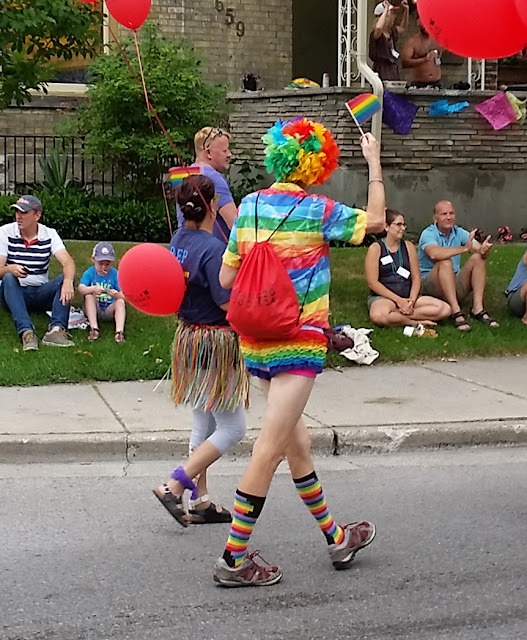 My favourite outfit this year was the head-to-toe rainbow worn by the gentleman above. He is a familiar presence in the parade and I would guess he's in his late 60's. He's got damn good legs! The guy with the bike asked to be sprayed and he got his wish. In the background are members of the Canadian Armed Forces, who were marching in the parade for the first time this year. It was cloudy, and we had rain later in the afternoon, but it held off until after the parade. The street on our corner was wet from Leif's enthusiastic spraying of the parade participants. 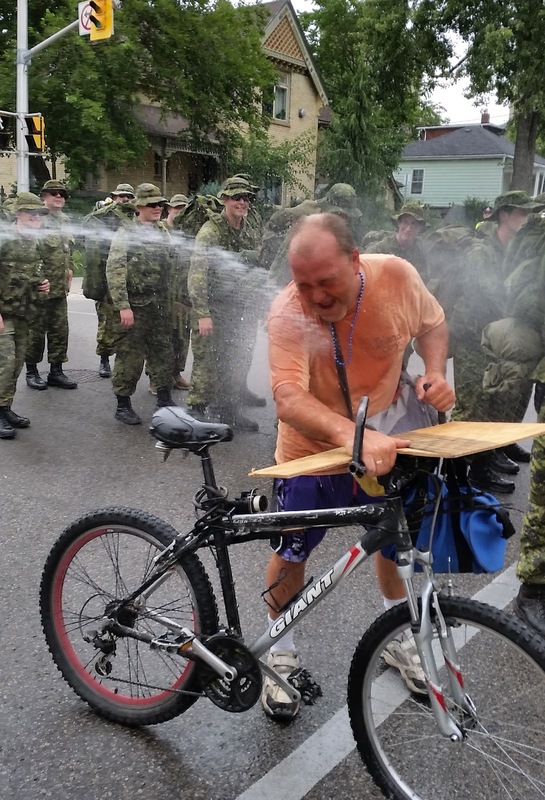 It was hot and humid and many people requested they be hosed down, but two police officers came over and gave Leif a hard time about spraying people saying that "People who didn't want to be sprayed were getting sprayed" and they wanted him to stop. He explained he was only spraying those who asked for it but they gave him a talking to for several minutes before they left him alone. 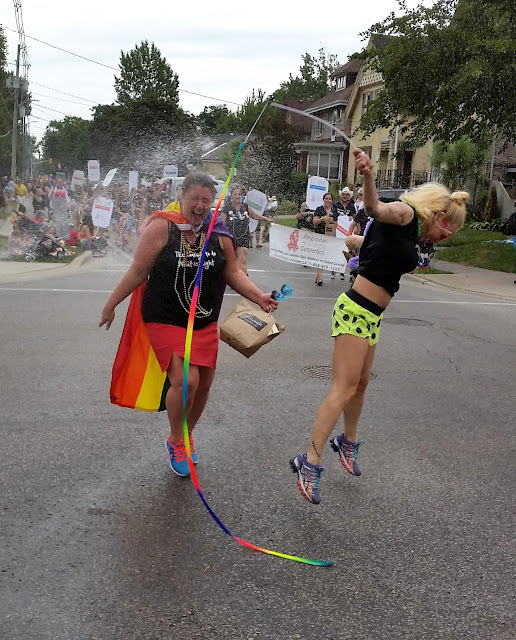 A few minutes later I was sprayed full on by a parade participant with a super soaker, without my consent, but apparently that was fine. Most of the police officers who work at the parade are great, but every now and then you get one or two that seem to feel they aren't doing their job if they don't give someone a hard time. 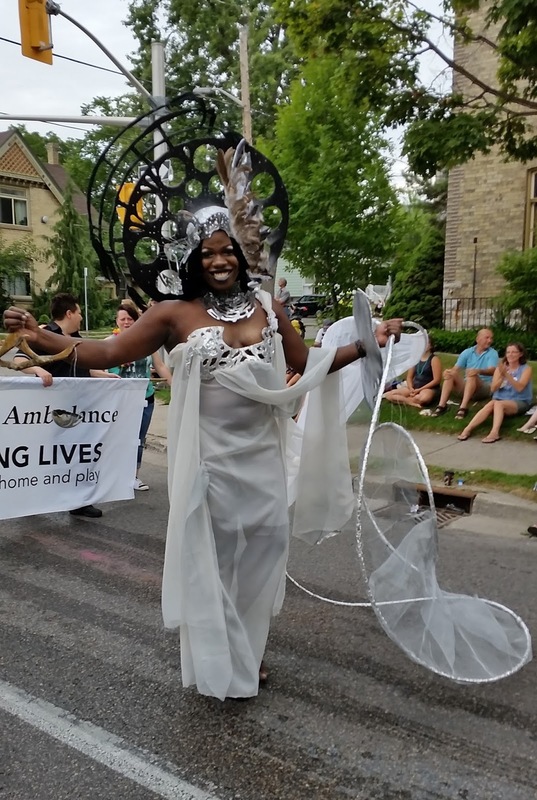 Naomi Nadea makes her own costume, complete with spectacular headpiece, for the parade every year, and I always look forward to seeing her latest creation. That was the parade for this year! 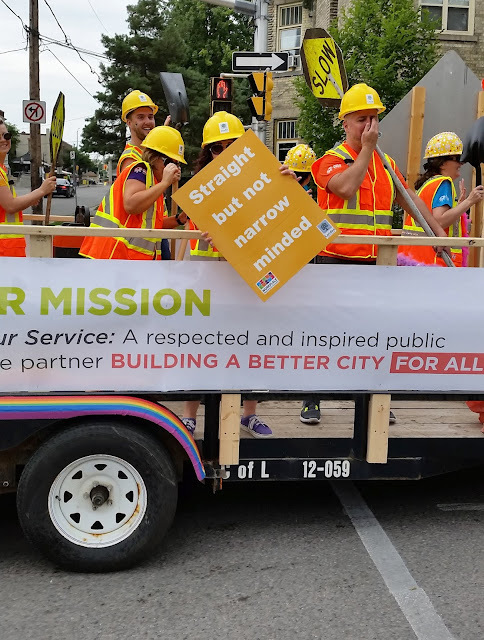 It's an excellent occasion to get to know your neighbours and support your community, so if you've never attended, mark it on your calendar for next year. That looks like a grand time! Victoria's parade is humongous, so I tend to avoid it due to the crowds. I could handle a parade that size! That looks like a fun parade and the costumes are great! That third last photo is just brilliant! I would have LOVED to pilot one of the mini-vehicles. And I would so love to be as strong and limber as the pole dancers! Way cool to see the military marching. Great idea! Kudos to them. In fact, kudos to everyone! Thanks for sharing your wonderful community parade. Fabulous! amazing pics and so glad to see all the people enjoying a good time together!! 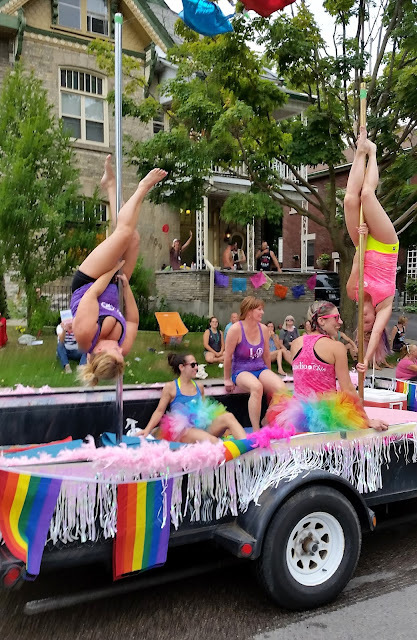 An amazing review of a very festive Pride Parade. This year was especially important because of Orlando. 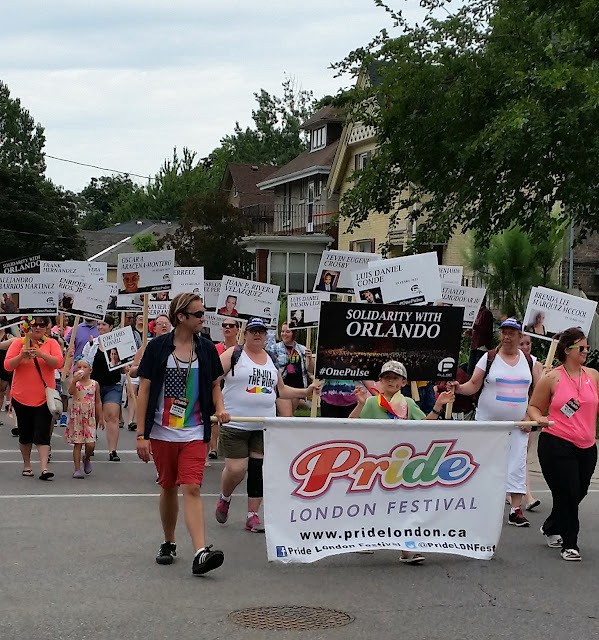 Thank you for sharing London's celebration! I enjoyed your work very much. Thanks for sharing this here. You have to include more information about this topic. Try to write all that information in your own words. You can use some imaginative writing tips in your blog to make more beautiful one.